When you are out walking in nature you may catch a glimpse of a rodent or two. The random fuzzy mammal you encounter would generally be a squirrel or possibly a chipmunk. They both belong to the rodent family. There are some similarities between these animals as far as the family that they belong to. However there are many things that hold them apart as completely different animals. The way they look, what they eat, hibernation habits, are a few things that holds them apart as individuals among the rodent family. Being in the rodent family they both have four sharp incisor teeth along with flat teeth in the back to help in grinding harder foods such as nuts. They also have 4 four toes on the front feet and five on the back. Although they eat the same foods, mostly nuts, berries, seeds, mushrooms, bird eggs and nuts, squirrels simply eat their fill and will store the rest away someplace for later consumption. Chipmunks have special pouches in their cheeks that they can store food in while they are foraging. Chipmunks burrow tunnels underground which are used for hoarding food for later use. While squirrels are true hibernators, chipmunks are not. A squirrel like many hibernating animals will eat a large amount of food to build up enough fat to live on during the winter months. A chipmunk on the other hand will store food in tunnel within its underground burrow to eat during the long winter months. Often chipmunks stay underground during the winter but remain somewhat active. Probably the greatest difference between squirrels and chipmunks are the looks. Squirrels and chipmunks are related, but chipmunk are smaller have lost traits such as squirrel's bushy tail, perky ears and silken fur. Squirrels usually weigh around 8 ounces and chipmunks are half that size. Chipmunks are smaller and faster. 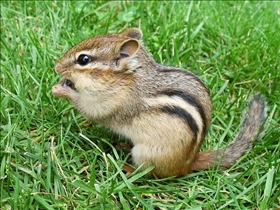 A chipmunk has 5 dark brown stripes that run from its head to its tail. 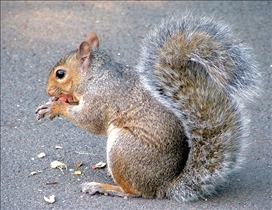 A squirrel has 13 stripes also dark brown in color that run the entire length of its body. The squirrel does not have the stripes on its face like a chipmunk does. Another difference between the two is where they live. Chipmunks prefer wooded areas where it is easy to find nuts and berries, while squirrels prefer grassy areas. Squirrels are noticeably larger than chipmunks and have different markings. Squirrels tend to eat as much as possible to store body fat during the winter, while chipmunks stow away foods in tunnels for consumption during the winter months. While squirrels are true hibernators, chipmunks will only sleep through the coldest spells of winter. Which small animal is a true hibernator? Chipmunks are active animal species and are very active during winters. Squirrels are bit lazy and over-eat during winters and stay inside only. This has been very helpful!! I am writing a compare and contrast essay on squirrels and chipmunks and needed information for the Venn-diagram! Thanks a million!!! I have seen only one baby squirrel all winter. Usually I have them at my bird feeders all winter long, but this winter I have only seen the one baby. Why is that? It seems like an odd time of year for there to be babies also. It does not go up to the feeder, but eats what is spilled onto the deck. Alvin And The Chipmunk movies are a fun diversion! I keep hearing from my wife that Ground Squirrels will damage the foundation of the house. All is see is tunnels, no damage. Cats like to watch them. I was trying to show my grandson the difference between squirrels and chipmunks. When low and behold, I see a dead squirrel with blood coming out of its mouth. I was appalled by it, redirecting my grandson's attention elsewhere. Blood greatest fear my grandson has. Although, his family and I haven't an clue as to where it originated. In the future, could you please somehow prepare your audience of what they may see, beforehand. Besides that, what I've reviewed was good.